The secret NROL-49 spy satellite blasts off from Vandenberg Air Force Base in California atop a huge Delta 4-Heavy rocket in this photo taken at 1:10 p.m. PST on Jan. 20, 2011. The clandestine cargo carried into polar orbit Thursday aboard the first California-launched Delta 4-Heavy rocket was a crucial replacement satellite for the nation's surveillance and security network, amateur sky-watchers say. The sophisticated imaging bird follows a long line of Keyhole-type spacecraft that provide ultra-high resolution imagery for the U.S. intelligence community, according to hobbyists who track orbiting satellites with remarkable precision. Ever since the Delta 4-Heavy rocket fired away from Space Launch Complex 6 at Vandenberg Air Force Base, the amateur observers have been hunting for the new satellite to figure out its identity. The conventional wisdom before the launch said the payload would fly into the Keyhole satellite constellation, and observations from the past few days proved the guess correct. The government agency responsible for operating the country's fleet of spy satellites, the National Reconnaissance Office, doesn't publicly reveal the characteristics of the spacecraft being launched. But the satellite trackers, located around the globe, can easily determine the payload by the type of orbit each new craft reach. The newest satellite joins the two primary Keyholes in space today, having launched in 2001 and 2005 from Vandenberg aboard Titan 4 rockets, plus an older one deployed in 1996 that's still running in a backup role. The Delta 4-Heavy flight targeted the orbit of the 2001 satellite, apparently to assume the lead observation duties from the aging craft that's now achieved the record for the longest prime mission duration, Molczan says. "This aged spacecraft probably is nearing the end of its useful life, which typically is determined by the supply of propellant required to maintain the orbit," said Molczan. The NRO on Thursday hailed the so-called NROL-49 launch as a success, which marked the Delta 4-Heavy's maiden mission from California and the largest rocket ever flown from the West Coast. "I'm grateful to everybody who worked so hard to make this mission happen, the launch team, the satellite vehicle team and our mission partners. It is always a great feeling to have hard work culminate in success. When the satellite becomes operational, it will assure the U.S. continues to enjoy superior vigilance from above," Col. Alan Davis, Office of Space Launch director, said in the NRO's post-launch press release. When the 2005 launch went up, it was supposed to be the final Keyhole before the NRO's Future Imagery Architecture program began fielding a new generation of optical and radar spy satellites. "Reconnaissance satellites had always been the bread-and-butter of the Lockheed Martin family of companies and they firmly expected that they would be awarded these new contracts. But, in a major surprise, Boeing was the apparent low-bidder and awarded contracts [in 1999] to develop both new satellite programs -- even though the company had never designed nor built a reconnaissance spacecraft," said aerospace journalist Roger Guillemette, who has covered military and intelligence space projects since the 1990s. "After massive cost overruns, missed schedule milestones and unresolved technical issues, the original version of FIA was finally killed in 2005 after more than $15 billion was spent on a program that never built a single piece of flight hardware." Needing to fill the void from the cancelled FIA program, the NRO ordered the construction of Keyhole satellites be restarted to build two additional satellites that would protect the nation's surveillance capabilities. The mission patch for Thursday's NROL-49 launch actually included the Latin inscription: "melior diabolus quem scies." Loosely translated: "the devil you know." Better the devil you know (Keyhole) than the devil you don't know (FIA). "NROL-49 is believed to be one of two replacement KH-11 ordered from Lockheed Martin as a stop-gap until a successor to FIA becomes available. The second one would replace the 2005 spacecraft, likely around 2013," Molczan said. 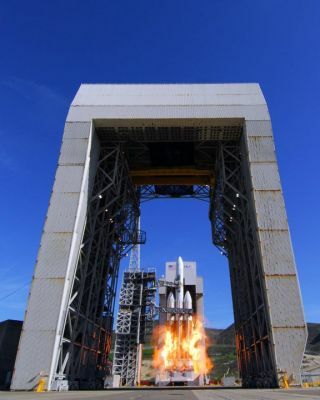 The next Delta 4-Heavy launch from Vandenberg is scheduled for late 2013. The FIA program had promised smaller satellites that could fit aboard medium-class rockets and the heavy-lift Titan 4 flew into retirement with the last-planned Keyhole in 2005. "The logic was that constellations of smaller, cheaper spacecraft could be launched in greater quantities resulting in more frequent overhead passes. This increase in imaging opportunities would mean that enemy forces could no longer hide from satellite passes and battlefield commanders would receive more timely overhead imagery," said Guillemette. "Two new spacecraft designs -- electro-optical and radar-imaging -- would be developed under the Future Imagery Architecture program. One key goal was to reduce the spacecraft size and weight. Lighter spacecraft would require smaller, less expensive launch vehicles as opposed to the aging KH-11 (optical) and LACROSSE (radar) satellites that weighed as much as a bus and could only be launched by very expensive Titan 4 rockets or the space shuttle." But the severe technical and budgetary woes killed the original FIA plan and forced the government to buy more of the tried-and-true big Keyhole birds that require a powerful ride into space. "Lockheed Martin was tasked to create updated versions of its venerable KH-11 electro-optical reconnaissance satellite that will still require the heavy-lift launch capacity of the Delta 4-Heavy," Guillemette said. The return to the massive satellites that needed the mighty Titan boosters to reach orbit meant the Air Force would have to bring the new-generation Delta 4-Heavy to Vandenberg for these two missions of extra Keyholes. The pad at Space Launch Complex 6 underwent an extensive upgrade over the past three years to accommodate the giant rocket. Vandenberg is the nation's launch site for sending intelligence-gathering surveillance craft into polar orbits for imaging nearly all of the planet's surface. The triple-barreled Delta 4-Heavy dramatically rose into the clear sky with fire and smoke at 1:10 p.m. PST, then headed southward over the open Pacific for an ascent that Molczan said was timed perfectly to achieve the intended Keyhole orbit. And the long-term future for optical reconnaissance appears to be under development once again, Molczan says, which would send up a new breed of satellite several years from now, probably to replace the bird launched Thursday. "Lockheed Martin announced on July 27, that it was developing what is believed to be the successor to the KH-11 and the cancelled FIA optical satellite, for which it expects to receive a multi-billion dollar order to begin construction in 2012. The first launch probably is targeted for about 2017, by which time NROL-49 would be nearing retirement."